Final Fantasy is a franchise that I’ve had an awful lot of trouble with over the years and, before I really got into console gaming as much as I am into PC gaming, I have to admit that I had the same misconceptions about it that a lot of people have. Namely that I thought Final Fantasy was one massively long-running series, not just a series of similarly structured adventures. It’s the same problem a lot of non-gamers seem to have with the Legend of Zelda series; they think that the main character must be called Zelda, not Link, purely because of the title. 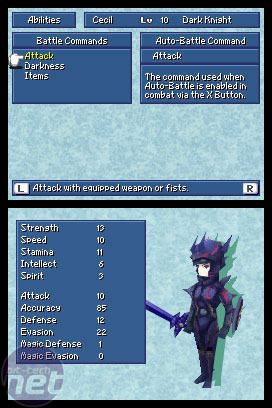 If you’re new to the Final Fantasy series, which is certainly possible given that the DS is so popular that it’s introducing a whole new generation of people to gaming, then rest assured that just because this is numbered as the fourth title in the series, it doesn’t mean you need to have played the first three. In fact, those first three have almost nothing to do with the story in this game. And if you’re an old-hack with all things Final Fantasy then you may as well gloss over a lot of the story information I’m about to offer up. It’ll all be old news to you and while the DS remake does include a lot of new content and scenes, the main premise of the story is the same. So, what is that story exactly? Well, to be honest, it’s the standard cookie-cutter rubbish that is the basis for 99 percent of Japanese RPGs. Just as Western role playing games can generally be firmly classified as those about D&D and those with spaceships and Star Wars references, so too can Japanese RPGs be broadly divided. Of those divisions then, which I’ll let you research under your own steam, Final Fantasy IV fits firmly into the old medieval-themed adventure about powerful crystals which harbour huge amounts of elemental energy. You see, there’s this king who is confusingly the lord of a land named Baron. The king is a bit of a maniacal old sod and wants to conquer the known world. To which end he starts conquering nearby nations and beginning a search for several elemental crystals. The search however is a brutal one, which raises questions in the mind of the King’s air force commander, Cecil. 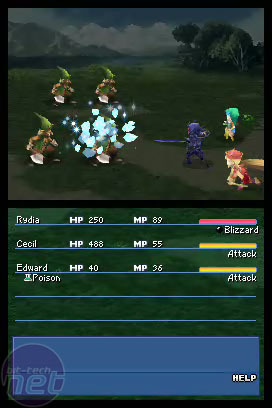 Cecil starts to question his lord after being forced to cut down swathes of innocents in search of the crystals and is soon demoted to the infantry. Accompanied by his close friend Kain, Cecil is sent off us a courier to a far-off town. Unfortunately, this seemingly simple mission rapidly gets even more complex than the plotline of a Japanese RPG and Cecil and Kane find themselves dragged down into a conflict with an evil Lunarian wizard named Golbez who it turns out was conspiring to acquire the crystals all along. And that’s the basic structure of the story in brief. In reality the game itself is actually a hell of a lot more complex and none of it is made any more accessible by the fact that plot focuses most of all on introducing the characters to the player instead of providing a basic frame to the game world – something I found difficult to cope with. It’s a problem I’ve noted in other Final Fantasy games; there’s a lot of focus on the spiky-haired protagonists when really the first thing I want as a player is a little bit of context. That and an explanation why Baron’s air force use pirate ships with wings strapped to the side when magic is a prominent and powerful part of the game universe. Dragons too aren’t exactly rare in this game. What's big, Japanese and comes on three DVDs? A really unsatisfying and nonsensical end to a joke! Oh, and Star Ocean: The Last Hope. We take a look at Square Enix's latest Japanese RPG and wonder it's more than just the adventures of big-haired teenagers in space.